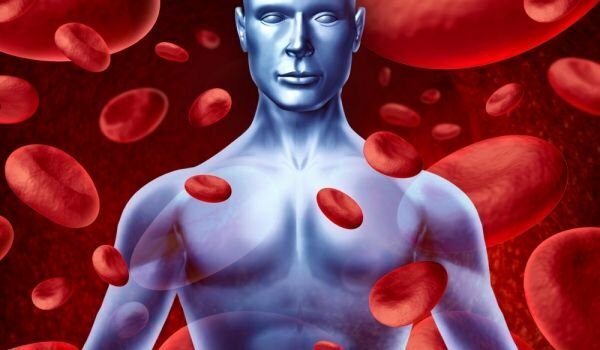 »How Much Blood is in the Human Body? Blood is that life-giving, bright red liquid that flows in our circulatory system and through which oxygen is carried by our red blood cells to all of the organs in our body. Human blood consists of plasma, which contains 90% water, salts, glucose and other vital substances. It contains proteins which strengthen the body's immune system and transport important nutrients. It's hard to determine exactly how much blood is in the human body since it depends on the person's age, their weight and other factors. It's generally accepted that an adult male has about 1.4 gallons (5.5 L) of blood, while females usually have about 1.2 gallons (4.5 L). Of course, these numbers are all relative because there's no way for a 165 lb (75 kg) man to have the same volume of blood as another man weighing twice that. Human blood represents 5-7% of our body mass but again this varies with age. In newborns, the volume of blood is higher percentage-wise than that of adults. A newborn has 150 cc per 2.2 lb (1 kg) of body weight, while in adults the ratio is 60 cc per 2.2 lb (1 kg) of body weight.